Earlier this week I posted about Brian Burke's apparently contradictory quotes about NTCs. On the one hand he says he won't give them out. On the other hand, he says it's important that free agents know he honors them. It didn't make sense. Burke was either backtracking, confused, or lying. Or maybe, just maybe, he was hiding something. It's a long story, but I managed to get the opportunity to question Burke directly, with some help from Bloge Salming. The entire thing was captured on film. The confrontation was heated, revealing, and also strangely familiar. Have a look. So now we know. God help us all. Freaking awesome. Burke's pauses slayed me. Very good - still need to work on Burke's pomposity. Maybe a Ted Baxter voice. You've got Nonis nailed though. "You're gonna scrap the rebuild!" Seriously, just pissed my pants at work. Awkward, but totally worth it! The only problem with this is the Canadian characters should have had their whole heads move when they talk, ala South Park. 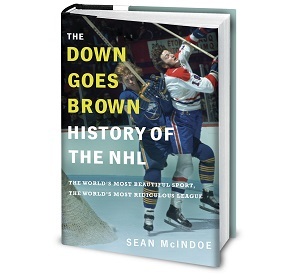 I'm considering becoming a Leafs fan so I can really grasp 100% of all that is written and produced on Bloge Salming and Down Goes Brown. For some reason, Nonis slayed me. Great work to both of you. I'm starting to thank God for the Stempniak trade. It's turning into a meme that has the power to bring a smile to this miserable fan's face. 'Lt Stempniak' and '27 goals two years ago' need to enter everyday parlance. We've got to keep that kid around longterm. Oh, and terrific scene, masterfully done. Five stars. Sign Tom Cruise in the offseason. love the few good men spin. too funny. The was excellent!!! The Lt. Stempniak line was pure comedy gold. Watching it over and over again . . . it's STILL funny! Just because Burke wants to honour an existing contract is doesn't mean he wants to make similar contracts in the future. He wants to respect the deals player have, it isn't specifically about NTC, but building a reputation of trustworthiness.